Blizzard-like conditions and exceptionally high accumulations of snow are expected tonight and into tomorrow as Storm Emma arrives. With temperatures forecast to fall to as low as -7C, the National Emergency Coordination Group for Severe Weather has urged people to stay indoors until the Status Red weather alert is withdrawn tomorrow. There are two separate weather warnings in place for the country tonight. A Red snow-ice warning is in place for Munster, Leinster and Galway. The warning will remain in force until 6pm tomorrow evening. Southern and eastern coastal counties are expected to receive exceptionally high accumulations of snow. 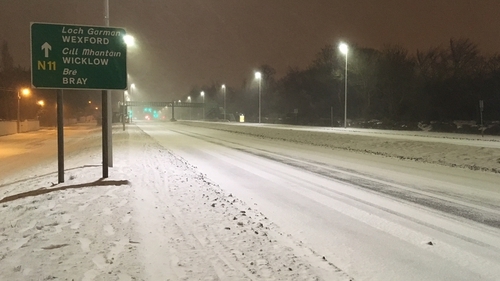 There are numerous reports of power going out across several parts of Dublin and heavy snow has begun to fall in other parts of the east coast, especially in Co Wicklow. Separately, an orange snow-ice warning is in place for Cavan, Monaghan, Donegal, Leitrim, Mayo, Roscommon and Sligo. Met Éireann said scattered heavy snow showers and icy conditions are likely to occur during Friday. The warning is in place until 6pm on Friday evening. Taoiseach Leo Varadkar said the risk to life presented by the severe weather conditions should not be underestimated by anyone and urged people to stay indoors until the red alert is lifted at 6pm. 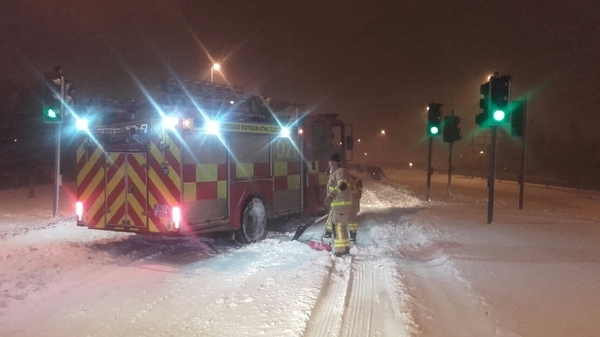 Director of Communications with Transport Infrastructure Ireland Sean O'Neill said crews have been working hard to keep the roads clear, but nobody should be on the roads unless there is an emergency. Mr O'Neill said this is extreme weather and people should heed the warnings to stay off the roads. Transport across the country came to a standstill today with all services cancelled by the afternoon. There will be no Dublin Bus, Luas, Dart or Iarnród Éireann services tomorrow. In Northern Ireland, public transport operator Translink reported a number of delays to bus and rail services. Despite all flights being cancelled until Saturday morning, Dublin Airport remains open and crews are working to clear snow from the apron and taxiway. Six hundred flights in to and out of the airport have been cancelled tomorrow, where more than 70,000 passengers had been expected to pass through. Cork Airport, Kerry Airport, Shannon Airport and Ireland West Airport will reopen on Saturday morning. Snow affected a number of flights into and out of Belfast International and the George Best Belfast City Airport with cancellations and delays today. A warning of very high tides is in place in Cork and Dublin. Cork County Council has warned of very high spring tides and the risk of coastal flooding over the next few days in Midleton, Youghal, Clonakilty and Bantry. It said that the high tides will occur at approximately 6am and 6pm tomorrow and at 6am on Saturday. Dublin City Council said that because of high tides, car parks on the Strand Road in Sandymount and on the Clontarf Road near the Alfie Byrne junction, will be closed until next Monday, 5 March. Schools, third level institutions and colleges of further education countrywide will be closed tomorrow. The HSE has cancelled all outpatient appointments and non-urgent surgeries for tomorrow. It said that the National Ambulance Service is prioritising emergency calls. "We are asking people to consider if they have an absolute emergency situation before calling for an ambulance. If you do need to call an ambulance please know or have your Eircode to hand," it said. The HSE also said that the GP "out-of-hours" service is operational but will face challenges in going to see people in their own homes. The HSE is advising people with hospital or healthcare appointments to contact facilities before making unnecessary journeys. It also advised that people should know their Eircode number, should they need an ambulance during the severe weather. All post offices were closed by 1pm today and will not reopen until Saturday morning. A spokesperson for An Post said social welfare payments will be safe and secure for people to collect once the bad weather is over. The Defence Forces are on standby to deal with emergencies as and when they arise. In a statement, it said that in the last 36 hours, 250 personnel and 85 vehicles were deployed to support local authorities. It said that the majority of the tasks were to support the HSE in ensuring that staff could get to hospitals and see house bound patients.